Home Google CONFIRMED! Google Drive Is For Real. 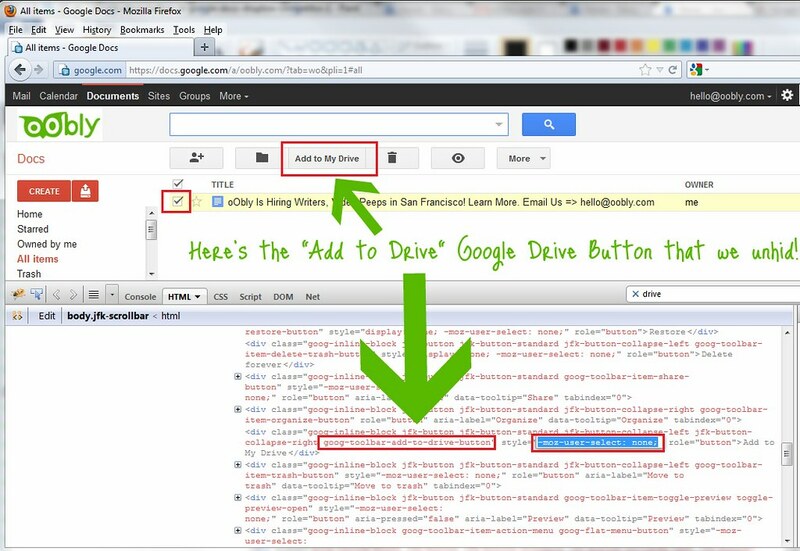 “Add To My Drive” Button In Source Code! While the internet has been abuzz with “rumors” on Wall Street Journal, Wired Magazine, PC World and other major news media outlet, here at oObly, we have been able to confirm that Google Drive cloud storage is indeed real. Today, I uncovered source code on Google’s document application Google Docs, which is currently using CSS to hide a “Add to My Drive” button for the documents. In this 1st screenshot, notice that there is a HTML DIVelement with text “Add To Drive” and several CSS style names including one that reads “goog-toolbar-add-to-drive-button”. Notice how the CSS style for display is set to none. 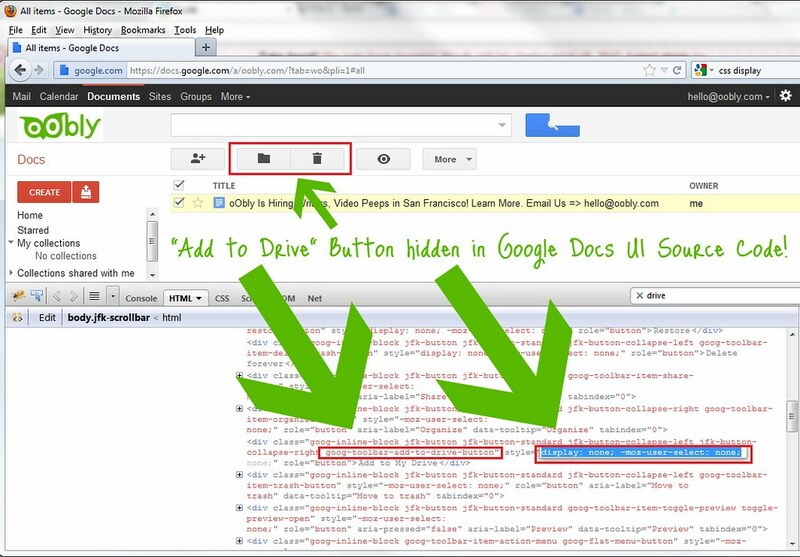 This essentially hides the button that would be rendered by the HTML code, in the Google Docs UI. Now, I deleted the CSS style for display that was set to none. Notice how the “Add To Drive” button now appears on the top menu for the selected document. Neatly sandwiched between the “Organize” and “Move to Trash” buttons. So this is evidence that Google’s cloud storage service called “Google Drive” that will compete with the popular Dropbox, is indeed in the works, and from the looks of it, very close to completion and release. Remember, you saw it here first! Like us on facebook and follow us on twitter for up to date news on startups, tech companies, gadgets, events and more! One Response to "CONFIRMED! Google Drive Is For Real. “Add To My Drive” Button In Source Code!"